According to the Wayne County Historical Society’s publication of the Wayne County Cemetery book, Union Soldier John Woolbright was buried here. In the late 1930’s, a Government Quartermaster marker was acquired and dedicated at this site formerly recognizing his burial place. He was said to have been killed in a skirmish between Union & Confederate soldiers in 1862-1864. Woolbright was said to be a native of Giles County, Tennessee. There is no marker here and according to my sources, it has been missing several years. 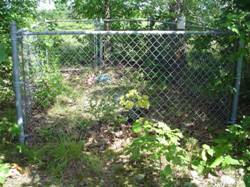 A chain link fence encircles the grave site as can be seen in the photos. 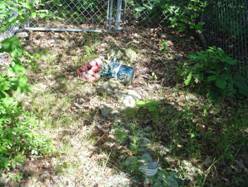 Another publication states that he was buried at the Wesley Chapel Cemetery. I assume that to be the cemetery near the present day Central community. Those records are on this web site and I did not find his grave there. That doesn’t mean that he isn’t buried there, because there are many very old graves at Wesley Chapel, with the first burial in 1819. There is just a small contradiction in his grave location.